Even more money went to so-called 527 political groups, which unlike candidates or traditional political action committees, may accept unlimited donations. Jeffrey Levy-Hinte, producer of "The Kids Are All Right" and president of Antidote Films, along with his wife Jeanne, have contributed more than $3.6 million to 527s, of which more than $3.3 million benefited identifiably Democratic or liberal organizations. It's a safe bet that Democrats will make their own heart-felt (if not tearful) acceptance speeches by receiving so much cash. But don't sound for the orchestra yet! There was still a single contribution to a Republican party committee, a $7,500 contribution in 2004 from producer Michael De Luca of "The Social Network" to the National Republican Senatorial Committee, as well as a $1,000 gift to Republican Matt Fong from Michael Medavoy, producer of "The Social Network." The nominees this year are … Javier Bardem, Jeff Bridges, Jesse Eisenberg, Colin Firth, and James Franco. And the winner is … Jeff Bridges! For the second year in a row, Bridges has won the Money-in-Politics Oscar. He and his wife have made nearly $68,000 in contributions to federal-level political candidates, party committees and the political action committee moveon.org. Last year, (in addition to winning a Money-in-Politics Oscar) Bridges received an Academy Award for his role in "Crazy Heart." He may repeat his win because of his acclaimed role as Rooster Cogburn in "True Grit." Being Bridges' congressional representative almost guarantees a contribution. His congresswoman, Rep. Lois Capps (D-Calif.), has received more than $20,000 from Jeff and Susan Bridges over the past seven election cycles, the Center finds. Sen. Barbara Boxer (D-Calif.) has received $4,400 from the Bridges. The Bridges also live part-time in Montana, and the Big Sky Country's two Democratic senators, Max Baucus and Jon Tester, have received $4,250 and $250 respectively from the Bridges. The couple supported Barack Obama's 2008 campaign by doling out $2,300. The only other contender for this award was James Franco, who also contributed the legal maximum amount of $2,300 to Obama's presidential campaign. The nominees this year are … Annette Bening, Nicole Kidman, Jennifer Lawrence, Natalie Portman and Michelle Williams. And the winner is … Annette Bening! Liberal activist Ralph Nader, the former Green Party and independent presidential candidate, is one notable politician among her recipients. Nader collected the then-maximum $2,000 from Bening during the 2000 election. Barack Obama also received the legal maximum, set at $2,300 in 2008. Most of Bening's contributions have focused more on state party committees. Democratic Party committees from Florida to Wisconsin have benefited from her money, though the Democratic National Committee has collected $7,700, the largest recipient of any of Bening's contributions. Kidman, for her part, has contributed $25,500 solely to Democratic candidates and party committees, including $2,000 to former Vice President Al Gore (D) and $2,500 to the first Senate campaign of Hillary Clinton (D-N.Y.). The nominees this year are … Christian Bale, John Hawkes, Jeremy Renner, Mark Ruffalo and Geoffrey Rush. And the winner is … Mark Ruffalo! Ruffalo, also of "The Kids Are All Right," is by default the winner because no other nominee has contributed to a federal political candidate, party or political committee, according to Center research. But that doesn't mean he's been a weak donor. Ruffalo has contributed more than $13,000 to largely Democratic organizations and candidates since the 2004 election cycle. In addition, he donated $2,500 to a Democratic 527 organization. Barack Obama has received more of Ruffalo's contributions than any other candidate, at $2,750. But the actor donated to more than one presidential candidate during the long 2008 primary race, as two longshot presidential candidates, Rep. Dennis Kucunich (D-Ohio) and ex-Sen. Mike Gravel (D-Alaska), received $1,000 and $700 in Ruffalo bucks, respectively. Ruffalo also contributed $6,000 to the Democratic National Committee during 2004 election cycle. The nominees this year are … Amy Adams, Helena Bonham Carter, Melissa Leo, Hailee Steinfeld and Jacki Weaver. And the winner is … Melissa Leo! Like Mark Ruffalo, Leo wins by default because she was the only nominee to donate money to a federal political candidate, party or political committee. Admittedly, one of the nominees -- Hailee Steinfeld -- is 14 years old, although federal law does not prohibit a young person from donating so long as the money is his or hers. Leo, who starred in "The Fighter," has split $500 between two Democratic heavyweights. Sen. John Kerry (D-Mass.) received $250 during his unsuccessful presidential bid during 2004, and Sen. Russ Feingold (D-Wis.) collected $250 from Leo during his unsuccessful re-election campaign during 2010. The nominees this year are … Darren Aronofsky, David O. Russell, Tom Hooper, David Fincher and Joel and Ethan Coen. And the winner is … David Fincher! In a crowded field of three generous donors, Fincher -- who directed "The Social Network" -- pulled ahead of Aronofsky and Russell because of his $7,100 in contributions. Obama received $2,300 during the 2008 election cycle from Fincher, and the remainder went to the officially nonpartisan Directors Guild of America during the course of four election cycles. Democrats have, however, received a majority of contributions from the Directors Guild of America, the Center's research indicates. For example, during the 2010 election cycle, the Guild contributed $57,000 to Democrats running for the U.S. Senate, compared to just $22,000 for Republicans running for the Senate. Among House candidates, Democrats received more than $114,000 as opposed to $54,000 for their Republican colleagues. Russell, director of "The Fighter," comes in second with $4,200 in contributions. Of that amount, $1,200 went to the Directors Guild of America, $2,000 to Howard Dean's failed presidential bid in 2004 and $1,000 to Sen. Barbara Boxer (D-Calif.), also during the 2004 election cycle . Black Swan director Aronofsky's sole blip on the money-in-politics radar was a $2,300 contribution to Obama's presidential campaign. And the winner is… Jeffrey Levy-Hinte of "The Kids Are All Right"! Although many producers have contributed, there was no contest against the generous checkbook of Levy-Hinte and his wife, Jeanne. They have contributed more than $884,000 to federal candidates and party committees. And when they walk the red carpet, it practically turns blue. Of that total, more than $176,000 was spread among 81 different candidates -- all Democrats. Obama received the largest amount of Levy-Hinte cash -- $10,600, between the 2004 and 2008 election cycles. Ex-Rep. Patrick Kennedy (D-R.I.), who was the last member of the Kennedy family to serve in Congress, received $10,000 during the 2002 election cycle. Since the 2000 election cycle, the Levy-Hintes have contributed more than $700,000 to political committees, the vast majority going to Democratic party committees. The Democratic National Committee has received $252,200, the Democratic Senatorial Campaign Committee has collected $220,000 and the Democratic Congressional Campaign Committee has received more than $214,000. The Levy-Hintes have also given $10,000 to the Progressive Majority PAC and $4,000 to the Sierra Club's PAC. Their $884,000 in hard money to candidates, committees and parties is an impressive sum. But the more than $3.6 million they've donated to 527 political organizations is a true blockbuster. According to the Center's research, more than $3.3 million of that money has gone to identifiably Democratic or liberal organizations. No other nominee has come close to Levy-Hinte. The distant runner-up is David Hoberman; he and his wife have contributed nearly $135,000 to federal political candidates, parties and political committees. For the second year in a row, the Democratic National Committee dominates this category. 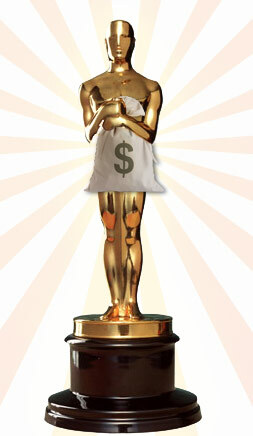 With nearly $344,000 in contributions from this year's Academy Awards nominees, the DNC is a popular recipient of money. The Democratic Senatorial Campaign Committee is the runner-up with more than $237,000 in contributions, although the Democratic Congressional Campaign Committee is close behind with $235,000 in donations. Another repeat winner! The Hollywood Women’s Political Committee, which won last year, received $17,875, with the money coming from Bridges, Hoberman and Michael Medavoy of "Black Swan." Obama, who has received $42,950 from 10 nominees. David Hoberman, along with his wife Tia, gave the legal maximum of $9,200 to Obama during his 2008 presidential run. Levy-Hinte, and his wife, Jeanne, are the "Avatar" of political donations in Hollywood. They have contributed a grand total of $4,556,050, including hard money and cash directed to 527 political organizations. Best Picture, with $4,830,486 in contributions. Michael De Luca, producer of "The Social Network," was only one of two contributors to a Republican cause. His only contribution was during the 2004 election cycle, when he gave $7,500 to the National Republican Senatorial Committee. The runner-up goes to Medavoy and his wife, Irena, who contributed $1,000 to Republican Matt Fong during the 1998 election cycle as Fong challenged incumbent Sen. Barbara Boxer (D-Calif.). They have contributed to numerous Democrats before and since, including more than $2,300 to Boxer. It is worth noting that Hoberman contributed money to ex-Rep. Jimmy Hayes (R-La. ), although Hayes was a Democrat at the time of the donation. If "The Kids Are All Right," the money is just right. Fielding half of the winners of the Money-in-Politics Oscars, "The Kids Are All Right" simply dominated with a total of more than $4.6 million. Admittedly, much of this total is buoyed by Levy-Hinte's generous political giving. Nicole Kidman contributed a grand total of $25,500 spread among every election cycle between 1994 and 2004 but hasn't given a dime since then. Did the Razzie Award-winning "Bewitched" cast a spell on her political giving prowess? Source: Center for Responsive Politics Senior Researcher Doug Weber contributed to this report.